‘Big data’ is often talked about as a relatively new phenomenon, but Last.fm has been collecting data about its users listening habits (‘scrobbling’, to use its own term) for ten years now. New data released by the CBS-owned company today reveal some fascinating insights into just how rich that data is. The data reveals that Smells Like Teen Spirit is the most popular song of the decade, while Coldplay takes the crown as the most popular artist. Rapper Lil’ Wayne proves divisive. His track Lollipop is both the most Loved and most Banned track of the decade. Hipster classic Such Great Heights by The Postal Service is the most skipped song overall, while Lady Gaga’s Poker Face is the most popular song that qualifies as a ‘guilty pleasure’. 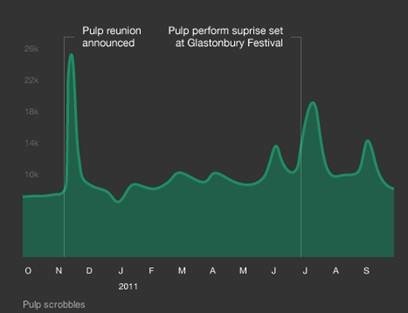 As you might expect, events such as bands breaking up or musicians dying directly correlate to huge spikes in listens. 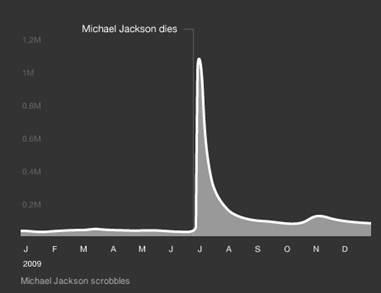 The death of Michael Jackson, for example, led to one million ‘scrobbles’ of his songs in one day. The breakup of the White Stripes proved particularly emotional to the band’s fans, leading to 60,000 scrobbles. Meanwhile, when Pulp reformed, it led to more listens than the breakups of more widely known bands like the Spice Girls, Led Zeppelin and The Police did. That probably says more about Last.fm’s user base than anything else, though. Back in 2002, the Audioscrobbler project pioneered the idea of storing data about the songs users listen to, by way of plugins for popular music player apps. Last.fm launched in the same year and the two teams worked closely together before Audioscobbler officially became part of Last.fm in 2005. CBS then acquired Last.fm in 2007. In other news from the company today, it’s killing off its Radio feature in many countries and has launched a new iOS app. You can see the top ten most popular artists and songs at the foot of this post, and you can explore the data for yourself via Last.fm’s special interactive mini-site. Let’s round off with the most popular tracks and artists on Last.fm over the last decade. Happy birthday, you big data pioneer!